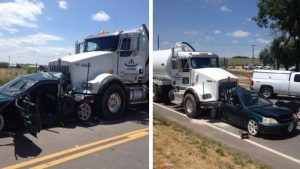 A North Carolina company recently agreed to pay $3.75 million to a South Carolina couple who were rear-ended by a company truck while the truck driver was talking on his cell phone. The company, Unify, Inc., is a yarn manufacturer that has 60 trucks traveling across U.S. highways. At the time of the collision, Unify had a company policy allowing its drivers to use their cell phones for a maximum time period of two minutes while they were operating company trucks. Lawyers for the injured couple contended the company’s policy promoted dangerous behavior, as Unify failed to enforce the policy. The at-fault driver’s cell phone logs showed that he would routinely use his cell phone for periods as long as seven hours during an approximate eight hour driving shift. Other evidence produced during the case showed that other Unify truck drivers also violated the company policy. Often, it takes a significant settlement payment to cause companies to change the way they operate. This case was no exception. As a result of the collision and settlement reached in the case, Unify decided to change its policy and prohibit its truck drivers from using cell phones or other mobile devices while operating their trucks on the roadway. In 2012, the Federal Motor Carrier Association approved a new regulation that banned hand-held phone use by commercial vehicle drivers. However, hands-free use of a cell phone, such as using a wireless Bluetooth device, is permitted. The federal regulation is merely a minimum standard. That does not mean that it is the best or safest standard. Some trucking firms ban any cell phone use while their drivers are operating their trucks and have taken measures to enforce the rules. For example, companies have installed cameras in the truck cabins, allowing them to monitor their drivers’ behavior while operating the trucks. Collisions involving tractor-trailers or other large, commercial vehicles and smaller cars often result in serious injuries and deaths. Companies who employ these truck drivers need to take all precautions possible to prevent their drivers from becoming distracted while driving. Even if they have rules or regulations designed to prevent driver distractions, such rules and regulations must be enforced to effective. The Savannah truck accident attorneys at Suthers Law Firm have handled trucking cases throughout the States of Georgia and South Carolina. If you or a loved one has been seriously injured or killed in a tractor-trailer collision or an accident involving other commercial vehicles, contact Suthers Law Firm toll free at 1-800-320-2384, or use the contact page on this website.